After you become proficient with basic handstand pushups against the wall, there’s a very simple way to make the exercise more difficult. By jumping up and working the handstand pushup on some parallettes, chairs, or something similarly tall and stable, you can dip your head below the level of your hands and achieve a greater range of motion. As you can see, you want to try and dip your shoulders all the way down to the level of your hands. You can even spread apart the parallettes or chairs slightly and try to dip even lower. 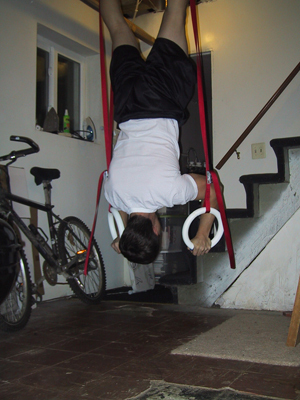 A natural progression from this point is to take your handstand pushups to the rings. Put your feet on the straps for balance at this point, as you’ll find those handstand pushups difficult enough. Here was my best effort of 15 strict handstand pushups on the rings. This was one of the original CrossFit Challenges (way back in the day when they had them on the main site). I managed to be the first athlete to complete that long standing challenge. Go me! You’ll want to try slowly lowering down into the new range of motion. You can again try to hold various positions along the way, but I find that simply trying to add an inch or two more depth to your handstand pushup each practice to work the best for getting the full motion. If it helps, you can even stack books under your head to act as a marker for your depth. Take away a book every couple workouts as you become stronger. When performing the handstand pushups, you can look downwards (left picture), which will recruit some of the chest. Or you can put your head in a neutral position (right picture), and move your hands slightly away from the wall which will start to flatten your back and leave the shoulders and triceps alone for the pushup. Which is better? Neither, they are just two variations. You’ll probably find keeping your head in a neutral position to be harder to press, but easier on the back. You’ll also notice that even with a neutral head position, the legs still arch over. I don’t think this is any cause for concern. As long as you’re using the wall for support for this skill, your legs will have to arch slightly over to touch the wall. Some prefer to turn their bodies around and have their stomachs face the wall. From this position you can straighten out your back and legs when performing the pushup. Downside? I find it awkward to get into (cartwheel or walking up the wall), awkward when falling (cartwheel or slide down against the wall), and no use in training people the correct amount of force needed to kick into a handstand. In the end, if you still prefer it this way, please go ahead. You will still get an incredible workout for your shoulders and arms. Adding depth to your handstand pushup is an easy way to increase difficulty. Keep at it until you can get a complete range of motion. Good luck! I use chairs to do the intermediate handstand pushup and I can go all the way down now. I can only do 1 at a time. I would like to do them on the rings. You mention to put you your feet on the straps for balance. Unfortunately, your picture doesn’t show your feet on the straps so I have a hard time to concept how to do that. If you can provide a picture, I would appreciated it. Note: I cannot do a hand stand without the wall.